These days, there’s a new kind of racing in the automotive world. It’s happening on the features list for every vehicle on dealers’ lots. Across all types of vehicles, but perhaps most noticeably in SUVs and crossovers that have exploded in popularity in recent years, car brands are rushing to roll out features faster and cheaper than their competitors. Horsepower wars are out. Content wars are in. The latest Kia Sorento seems to take content abundance to an extreme by offering more attractive technologies at a wider range of price points, including pushing itself farther into luxury-level pricing and polish than ever before. The Kia Sorento gets a major refresh for the 2019 model year, including new styling and an expanded list of features and technology. That’s certainly true of the version I tested, the high-end SXL trim with all-wheel drive and a price tag uncomfortably close to $50,000. It feels every bit as poised, refined and solid as the luxury-brand SUVs it competes with at that price, with the added benefit of an unusually long list of amenities for the money. Nappa leather seats with heating and ventilation, spectacular Harman Kardon sound system, smart cruise control, lane keeping assist, a “hands free” power lift gate and spacious cabin with seating for seven all add up to a premium driving experience. Even more impressive are the features Kia managed to pack into more attainable versions of the Sorento. A 7-inch display with Android Auto and Apple CarPlay comes on every version, including the base L trim. The EX trim, priced around $35,000, hits the sweet spot of the market with the content most buyers want in a new car, including lane keep assist that does a good job keeping the vehicle centered in the road as long as the stripes are clearly painted. 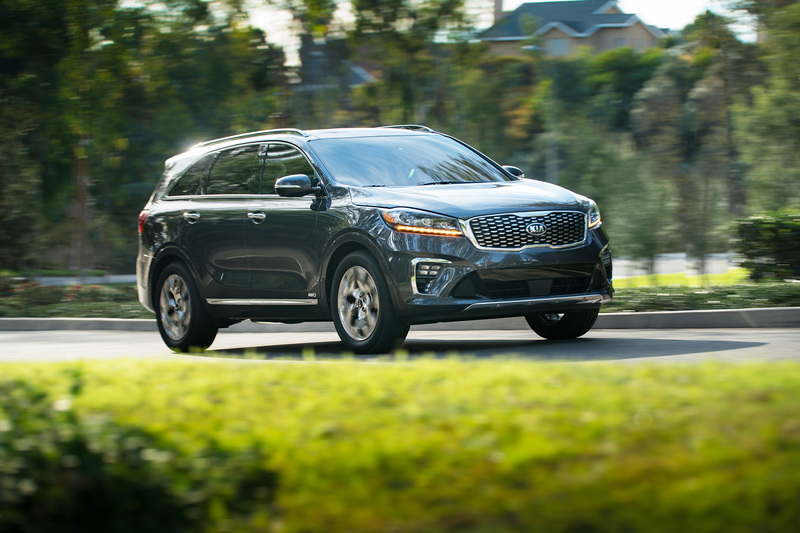 Three years after the all-new Sorento hit the market as a 2016 model, the 2019 version gets a thorough and noticeable upgrade. It looks sharper and more sophisticated both inside and out, and it now offers better performance thanks to an 8-speed automatic transmission and powerful V6 engine on the upper trim levels. 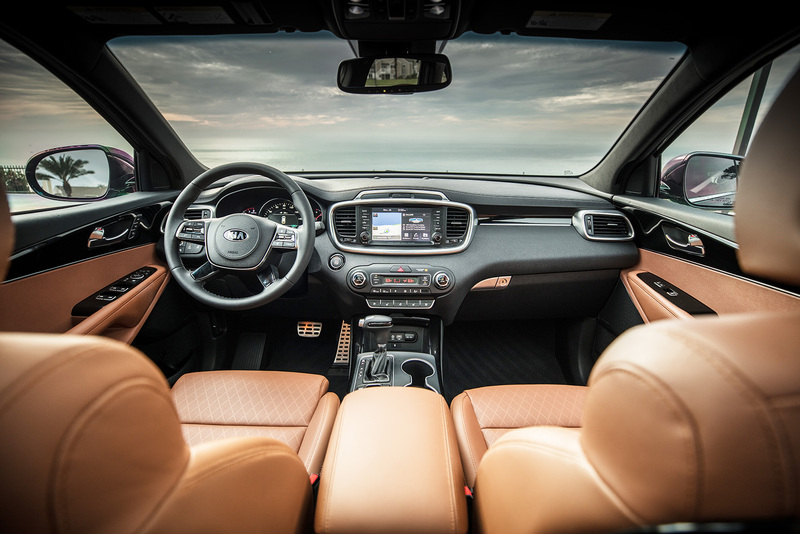 The Sorento now includes standard three-row seating for seven passengers on all versions. Its cabin is updated with a new steering wheel, shift knob, air vents and center console design. Seven-passenger, three-row seating is now standard on all Sorentos, and wireless charging is available to conveniently power devices that support it. The freshened interior delights the senses more than before thanks to a new steering wheel, shifter knob, visually appealing graphics, air vents and center console design. The changes combine to make the interior look and feel nicer than before. Outside, new front and rear fascias and a more finely detailed grille make it look more sculpted and aggressive than before. While it rides with the softness and grace of a nice car, the body appears bulked up with a truck-like toughness. Pricing starts at $25,990 for the L trim and ranges up to $46,490 for the premium-feeling SXL. It adds more features and sophistication, both in feel and style, with a major update for 2019. Its top-end trims move even more into luxury territory than before.